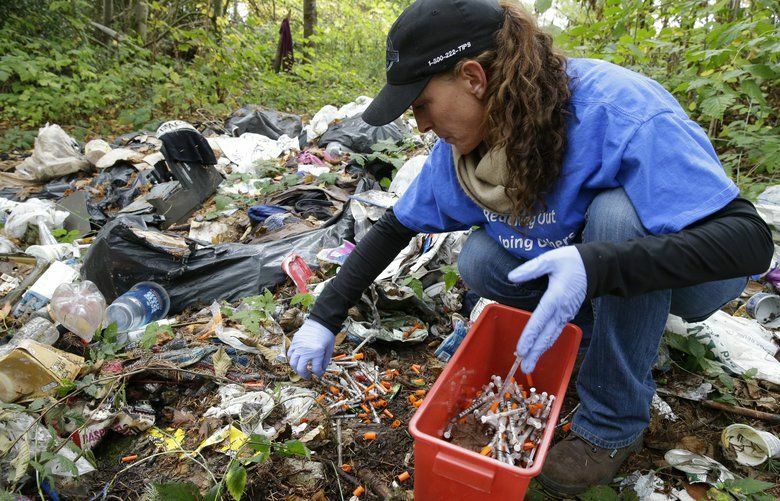 Though Snohomish County makes up 10 percent of Washington's population, 18 percent of the state's heroin-related deaths occur in the county, according to the Snohomish Health District. Faced with one of the state’s most acute opioid crises, public agencies in Snohomish County are gathering information on the size and scope of the problem. Police officers, firefighters, medical providers, social workers and others started collecting opioid overdose data on Monday for a weeklong look at the problem. This is the county’s second opioid overdose point-in-time “count,” with the results to be shared on July 25. 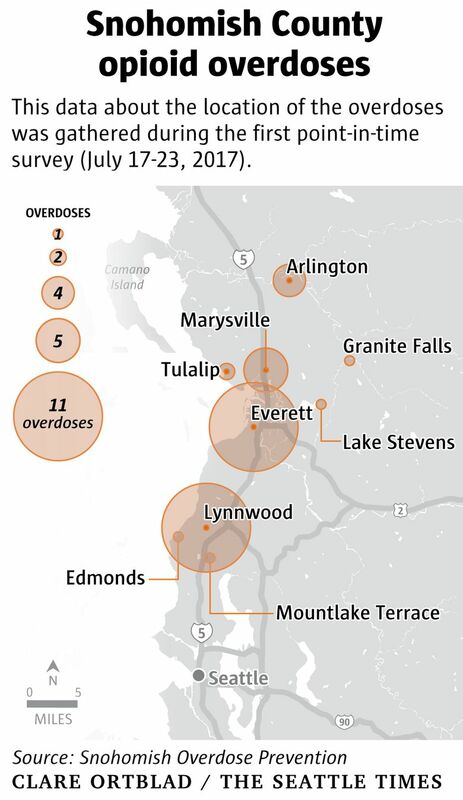 Though Snohomish County makes up 10 percent of Washington’s population, 18 percent of the state’s heroin-related deaths occur in the county, according to the Snohomish Health District. President Donald Trump declared the national opioid crisis a public health emergency in October. The number of deaths from opioid overdoses in the U.S. in 2016 was five times higher than in 1999. In 2016, there was an average of 115 deaths each day from opioid overdoses, according to Centers for Disease Control and Prevention. The first point-in-time survey counted 37 reported overdoses, which included three deaths, between July 17 and 23, 2017. Of those overdoses, 11 people were given naloxone — an overdose reversal drug known by the brand name Narcan — by the police or medical responders, while 16 people were given naloxone by a friend, relative or bystander. In Snohomish County, crimes such as car prowl and burglary are often committed to support opioid use, according to the Snohomish County sheriff’s Office spokeswoman Shari Ireton. During the last week of June, 34 percent of all people booked into the county jail tested positive for opioid use, Ireton said. The city of Everett has sued opioid maker Purdue Pharma, claiming that the company consciously supplied drug traffickers with pills. Other cities in Washington and across the country have filed similar suits. Emergency-room data from the Providence Regional Medical Center Everett reported 655 opioid overdose patients, who in total experienced 688 overdoses, between Jan. 1 and Aug. 31, 2017. Among the 655 are six patients under the age of 11, and 13 patients over the age of 90. The categories with the highest numbers were 21 to 30 years old and 51 to 60 years old, with 120 and 104 patients — some of whom overdosed multiple times — respectively. Ireton said the findings from last year’s survey show that the opioid epidemic impacts a broader range of residents — across age and socioeconomic background — than many might assume. “It’s not just in homeless encampments. Emergency medical services are responding to homes in nice neighborhoods,” Ireton said. Agencies that participate in the survey submit information such as age, race, time and location of overdose, where the drug was obtained and whether naloxone was administered. They can submit the information each day or at the end of the week. Ireton said that working together to respond to the deadly 2014 Oso landslide has strengthened partnerships among public agencies in Snohomish County. A county group called Multi-Agency Coordination formed in November 2017 to respond to the opioid crisis. Their aims include school outreach, training for dentists to lessen the availability of opioids, tracking opioid-related crimes, and improving drug-disposal services. “As we look at the slow-moving crises, that are killing as many people as Oso every year, the ability to partner and think outside of the box has been unique in Snohomish County and really powerful,” Ireton said. Capt. Dan Stites, who has served at the Snohomish County Jail for 18 years, said that the jail has been adapting to increased use of opioids. In recent years, medical staff have evaluated those booked into the jail to determine whether they are under the influence of any drugs or alcohol and the appropriate treatment plan. Since 2013, the jail’s medical unit has often operated at 200 percent capacity. Cots are brought in to supplement the 27 beds, Ireton said. Though the medical units were originally designed to treat hypertension or wounds, more than 90 percent of the inmates in the medical unit are suffering from opioid withdrawal. The jail’s medical team administers Suboxone treatment to mitigate withdrawal symptoms for some inmates. “It’s fairly daunting in a correctional environment to provide those services and care,” Stites said.